Naples is a funny old place. It sits on one of the most beautiful bays in the world and has a history going back to Roman times, and beyond to the Greeks. Tourists pour into one side of the city to visit Pompeii, Sorrento and the Amalfi coast. But very few venture the other side, even though historically this was where the Romans loved to come and play. One reason you rarely bump into tourists is that it’s decidedly hard getting about. Public transport is often packed and unreliable. And information is lacking on the ground too. I decided to visit one of the more interesting sights last week and it took two goes before I finally managed to find a way in. Since the one photo of the place I’ve posted on Twitter caused such interest I thought I’d share the secrets of its location here. But first… the place itself. 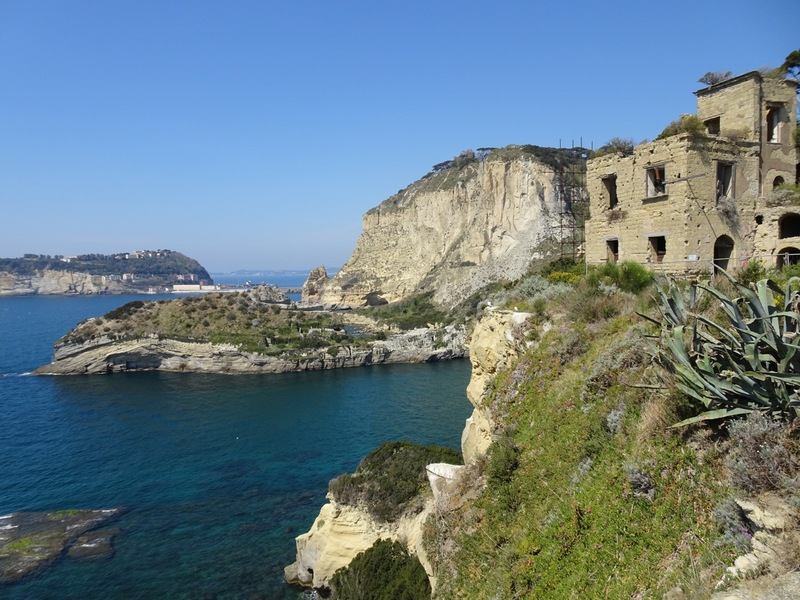 It’s called Pausilypon and lies beyond the sprawling and ancient Naples suburb of Posilippo beneath the hill on which sits the Parco Virgiliano. The villa once belonged to a notorious chap called Vedius Pollio, a rich knight in the time of Augustus seemingly hated by everyone. Pollio was famous for his cruelty. More than one sources record that Augustus was visiting him in this villa once when a servant broke a glass. Pollio ordered his favourite punishment. The slave was to be thrown into a pool of lampreys to be devoured by them (after which Pollio would devour the lampreys). Augustus was so appalled that he ordered the slave freed and every glass in Pollio’s villa broken by way of punishment. When Pollio died the villa fell into the ownership of Augustus strangely enough and was extended by later emperors. This part of the bay is full of history. 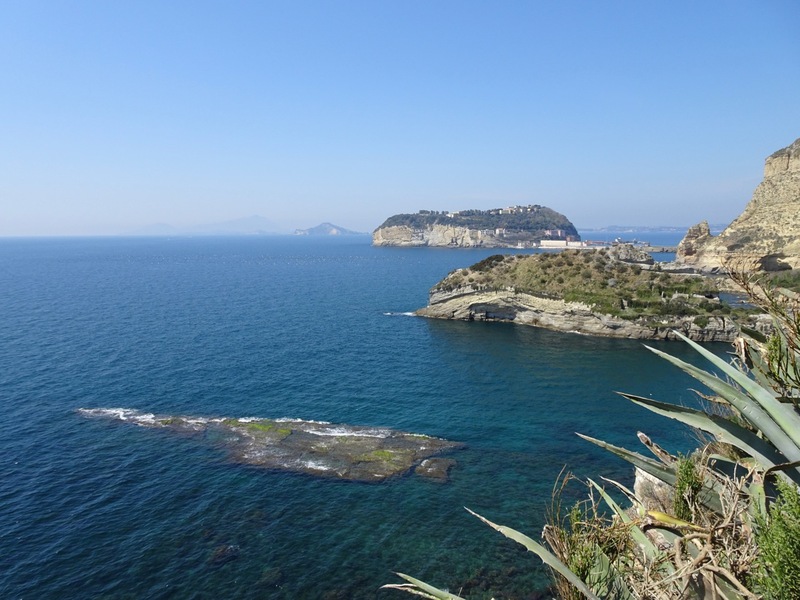 From the Parco Virgiliano you get a good view of the neighbouring island of Nisida, now joined to the mainland by a bridge. Here Brutus had a villa, supposedly discussed the assassination of Caesar and met Cicero too. Here Brutus’ wife Porcia committed suicide when the plot unravelled, supposedly by swallowing hot coals. Getting to Pausilypon is something of a feat. There are buses into the vicinity but few signs, and Google Maps will lead you astray to the wrong part of the park which is just a pretty beach with no way in. You are supposed to book in advance too and it’s a good idea to take along photo ID since you may be asked for it. More details here. The best way is to take one of the guided tours offered by the Gaiola organisation. They last an hour and a half, cost €5 and are well worth it. You need to book either by calling them on 0812403235 or 3285947790 (Tue – Sun; 10-16), or by email: info@gaiola.org. Though the email I sent hadn’t turned up and I still got allowed in so I think you can get in at the last moment too. For now the tours take place at noon Tuesday to Friday, and between 10 and noon at weekends but this may change so check. 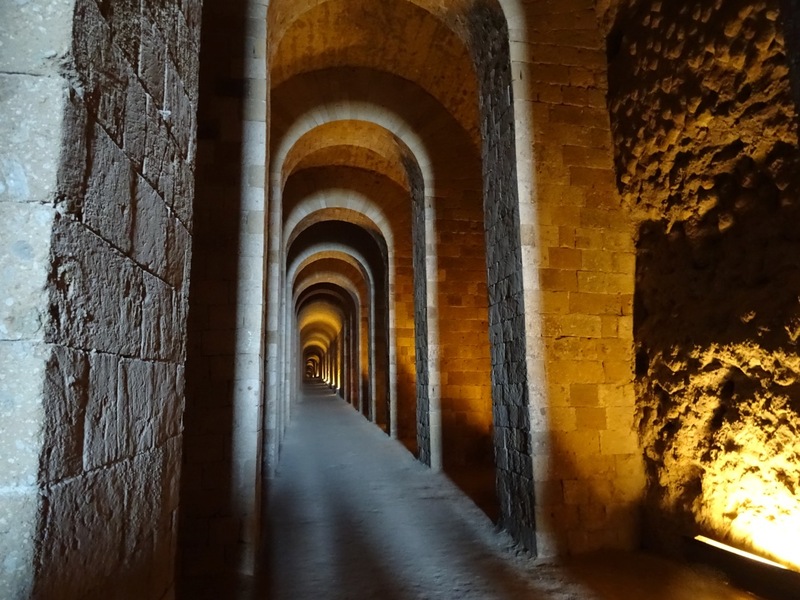 You get into Pausilypon through an extraordinary entrance, a seven hundred metre long tunnel known as the Grotto of Sejanus (see photos below). 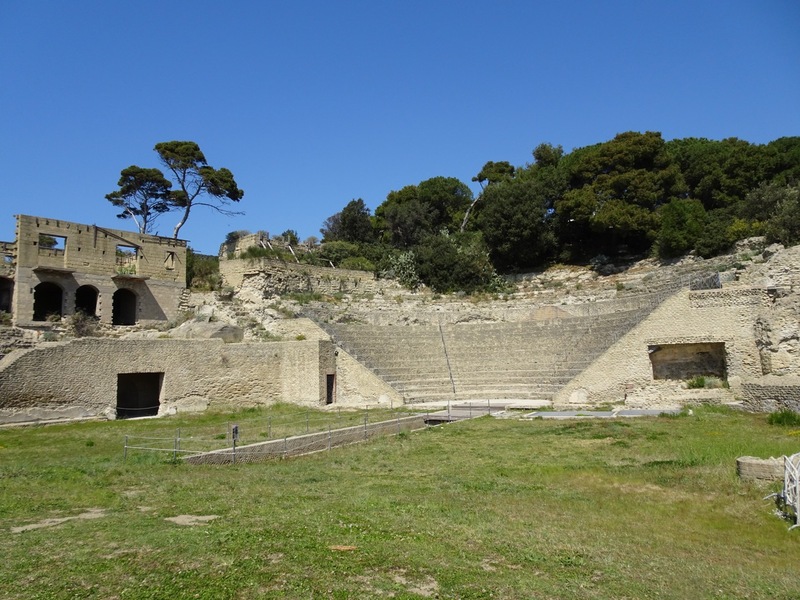 Then you emerge in a park where there are remains of the villa, two theatres and lovely views. It’s not Pompeii and much of the remains there have been restored. But you won’t have much in the way of company and it’s certainly worth a visit. In the distance the island of Nisida where Brutus plotted the assassination of Caesar and his wife Porcia committed suicide. Most of the buses stop at the top of the hill at the end of Posilippo. Google makes it look as if you walk directly down some pretty winding lanes to the park. You can’t get in this way. Worse, if you try you’ll run out of time to get back to the real entrance (which is why it took me two days to get in here). Instead get off the bus at the top of the hill marked here. Then steel yourself for a long walk down a busy and boring road to the grotto entrance at the bottom. There is one bus that goes nearby but I was told it turns up ‘once an hour, maybe’. 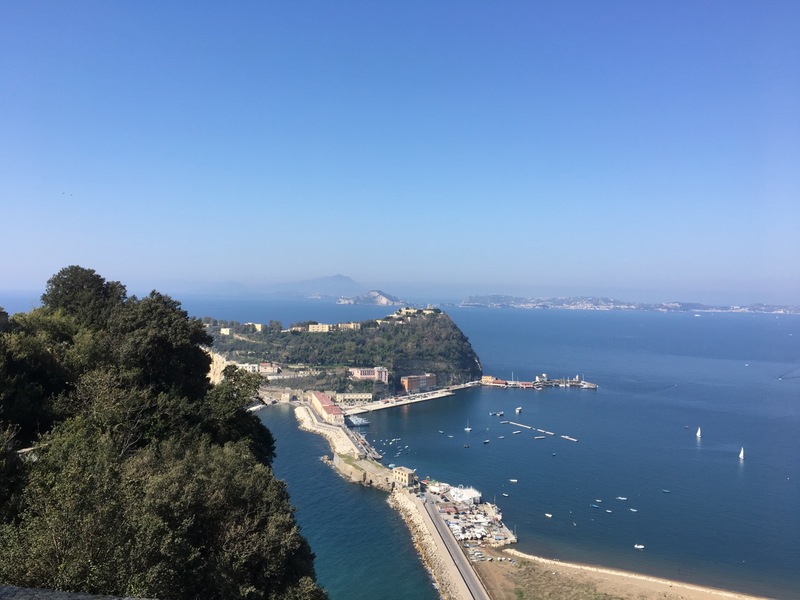 The 140 bus which runs from Santa Lucia in Naples through Mergellina and Posilippo every fifteen minutes (maybe) will deposit you at the hilltop reliably as will several others from the city. It’s a twenty to thirty minute walk from the bus stop to the grotto entrance and you’ll find yourself dreading the long walk uphill back. But fear not. 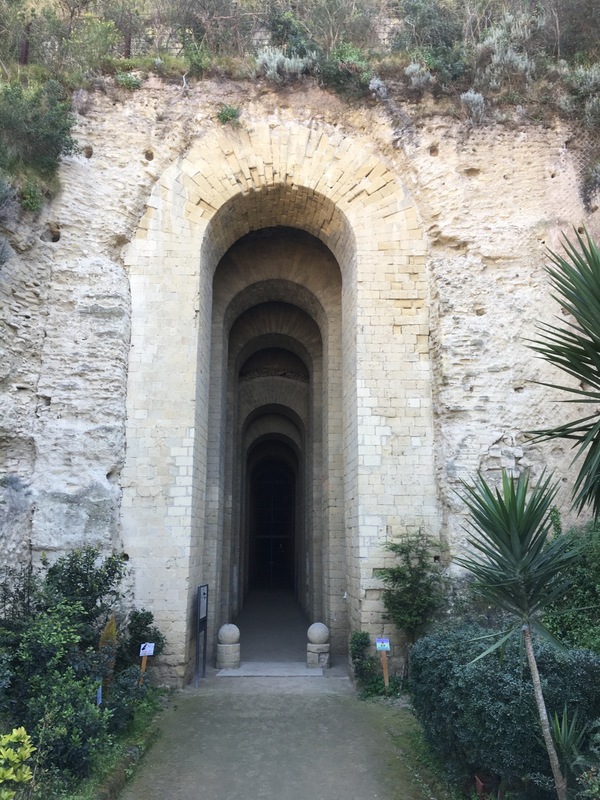 The guide on my trip allowed people out through a side entrance before the grotto which lets you take a shorter route up to the main road at the top where you’ll find the buses. Naples beyond the tourist hordes is like this, difficult to navigate and occasionally quite baffling. But the reward here is a lovely view and a sense of history enjoyed alongside a handful of other visitors equally pleased to have made the effort. Just make sure you head for the right way in.